It is true that your family are not always related to you by blood. “Family” are the people that love you and genuinely, unselfishly care how you’re doing (and what you’re doing) with no other motive. We know that one of “our family” has inspired our son from an early age. Grayson’s “Uncle Art” has given him an early interest in herbs and seasonings and lead him to question, “where do these come from?” Grayson’s always questioned every ingredient and is passionate about what to do with them. Art taught our daughter to cook scrambled eggs when she was two and she’s been cooking them ever since (she’s 3.5). She’s cooking all kinds of foods now. This is all thanks to our “family” member Art Smith. He has a very special skill of teaching children, they just love him! Art and his life partner, Jesus Salguiero, stayed up all night the night before Grayson’s first birthday party. They helped Grayson’s grandmother assemble his birthday present (a ride-in electric volkswagon) and cook a big, beautiful teddy bear cake (his famous hummingbird cake recipe). Art and Jesus have such a generous nature. We love, love, love Jesus. He is an artist with divine talent. When you see his art (internet does not show it like real life), you know he was born with a gift. Check out his website… it will take you into another realm. Susejart.com, it’s a real treat for the senses. Art and Jesus have been such a big part of our lives. We are so proud to call them “family”. Margie (my mom) & her best friend Art. Nate Berkus, Art Smith and Margie Geddes. Art loves children. He and Jesus established the Common Threads Foundation for underprivledged children (8-12 years old). He teaches them to cook and eat together. They learn about nutrition, preparing foods, world cuisines, customs and traditions. It’s a non-profit organization dedicated to children, the culinary arts and world cultures. Art said that “he wanted to teach kids through food and cooking that we are all more similar than different. Our world is a quilt, its people the fabric, joined together by common threads”. Many of Chicago’s culinary stars volunteer to teach classes and help with fundraising. There is a very special event coming up on August 21st that will unselfishly benefit Common Threads. Kumquat preserves made by Art. He wrote a sweet little note to me on the top. Art grew up on a farm in a very small (two square miles) town called Jasper in North Florida… think ‘Steel Magnolias”. His brother, Gene, runs the farm now with his wife and kids. Gene is an American version of Crocodile Dundee. He wears the most awesome hat I’ve ever seen in my life and has a big scar from a rattlesnake bite. Art’s mother (Addie Mae) lives near-by. Doesn’t she have the most beautiful name? My mom dreams about her creamed corn and her persimmon tree. They still can and preserve and have great southern recipes. The influence passes from generation to generation. Art and his mom, Addie Mae. Art is best known for being Oprah Winfrey’s personal chef. He goes to Oprah’s school in Africa for at least a month or two every year to see “his girls”. They loooove his pizza! Oprah's book about her school in Africa. Before he worked for Oprah, Art was the executive mansion chef for Senator Bob Graham when he was the governor of Florida. He has cooked for U.S. Presidents. He went to school at Disney’s culinary institute, the Walt Disney Magic Kingdom College Program. He made Disney proud. He also designed the galley on a Hakvoort ( a large motor yacht) and worked aboard the vessel for two years. 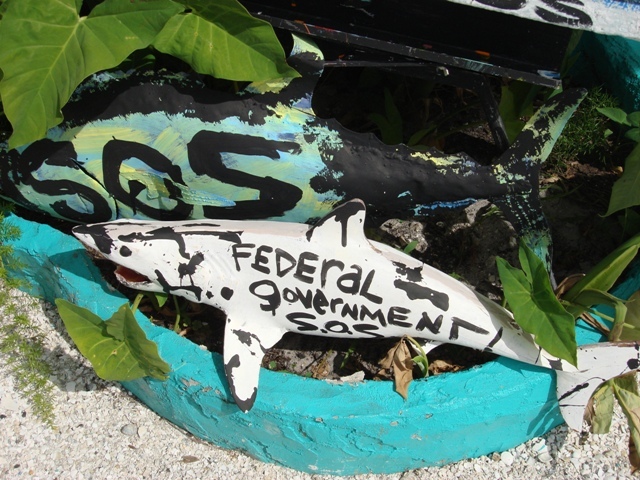 So, he’s seaworthy and has traveled all over the world. These are only a few details of his extraordinary resume. He’s on the advisory board with leading nutrition and child development experts for a new program called Sesame Street Workshop. They’re working on program develpment to set a foundation for healthy habits early in children’s lives. I always wished somebody would tell me how to get to Sesame Street when I was a child. I still love to watch that show and I do… with my kids all the time. Art received an honorary MBA degree from the Florida State University School of Business. It was only the second one to be given out in more than 150 years. He won the James Beard Foundation Award in 2002 for his book, “Back to the Table: The Reunion of Food and Family” and for Humanitarian of the Year in 2007. He’s written two other books as well; “Back to the Family” and “Kitchen Life: Real Food for Real Families”. I can assure you there will be more. He also has two restaurants. One is in Chicago called “Table Fifty-Two” and the other is in Washington, D.C. and is called “Art & Soul”. His signature dishes at Table 52 are goat cheese biscuits and macaroni and cheese. These biscuits are their signature for a very good reason… OMG! As soon as you sit down at your table they bring you these hot goat cheese biscuits. The mac and cheese is the most comforting you could ever taste, except- maybe… your own mothers, of course. My favorite is the shrimp and grits. Click here for some more pictures of Chef Art and his meals. [/caption]You might think Art is lucky to have worked for Oprah, but we know that Oprah is the lucky one to have Art… now, Jesus is the lucky one. 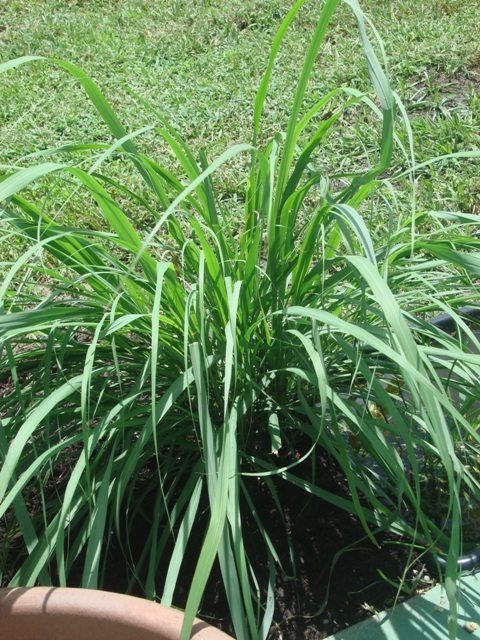 I just looooove lemongrass (Cymbopogon ciatrus). It surprises me how many people can’t identify it’s aroma. I think it’s way under-used in the U.S. But before I jump on my high horse, I have to tell you that it was growing in my yard for a long time (years) before I figured out what to do with it. I knew I was growing lemongrass, but really wasn’t sure how to use it. I’m glad I figured it out because it has become one of my garden favorites. A young lemongrass. It's called fever grass in the Caribbean. It’s really easy to grow. Once it gets established, it doesn’t need much care. I give mine a haircut once a year. 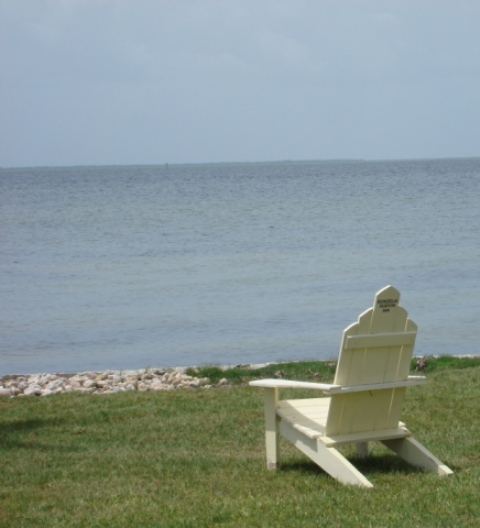 It grows well in warm climates such as Florida, but won’t do well in colder climates. My lemongrass did survive the record freezes in Florida this past winter without a problem though. I’m proud of it. 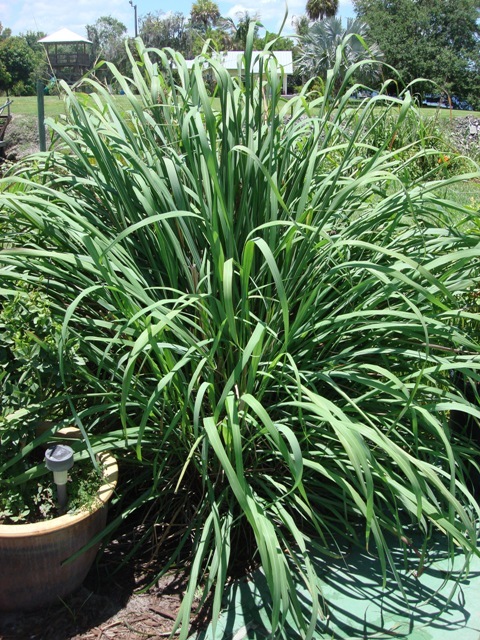 A mature lemongrass plant. It is filling in nicely after being pruned way back. This is what our lemongrass looked like after lots of plumes, a very cold winter and a haircut. 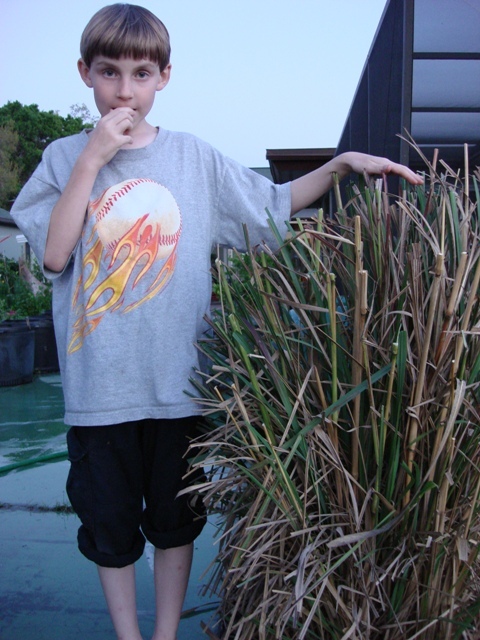 The picture above this one is the same lemongrass plant just a couple months later. The plant is a tall grass and gets beautiful plumes on it when it goes to seed. A lot of the leaves turn brown in the cold, like most grasses, but the plumes make that fact easy to ignore. I thought mine was a show-stopper. As I write this post, I’m thinking to myself that I need to plant more of it. The plant grows tall and wide though, so one is really enough for any garden. If you’re lucky enough to already have it in your yard, don’t ignore it. It’s awesome! 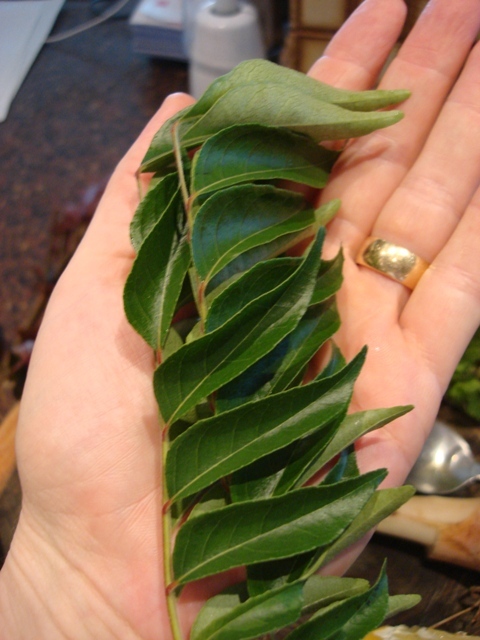 The edges of the leaves can be sharp, like the edges of paper. I handle mine with gloves if I’m cutting it back. 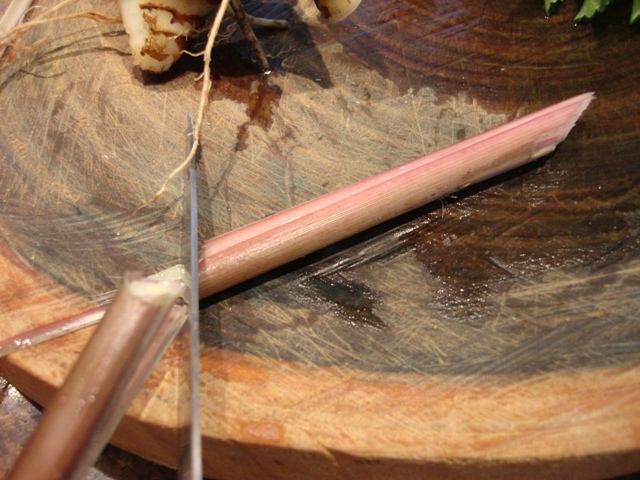 If I’m getting a piece to cook with, I just cut an individual stalk (stem) off with a sharp knife at the base. I don’t need gloves for this. If you know somebody that already has some growing and you want some, just ask for a stalk that has been dug out with some roots on it. This is the base of a very small stalk that I used for the picture... and then my iced tea. 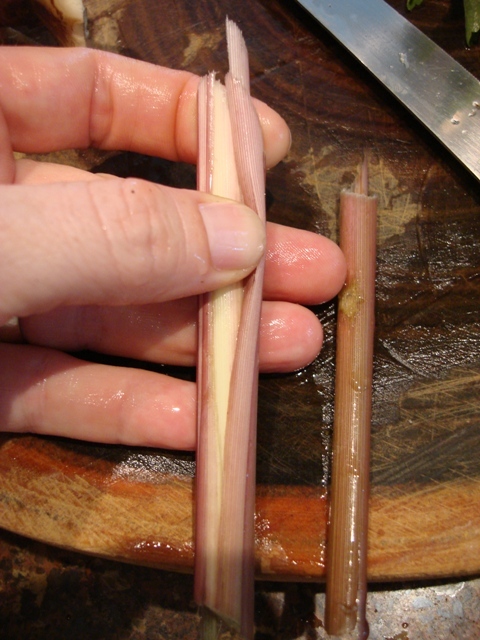 I slice the stalk right down the middle with a knife and the outer husk just pops right off. This is what I use to cook and eat. Sometimes I cut it into really small slices. The aroma is heavenly. That's probably why the essential oil is used for perfumes and candles. 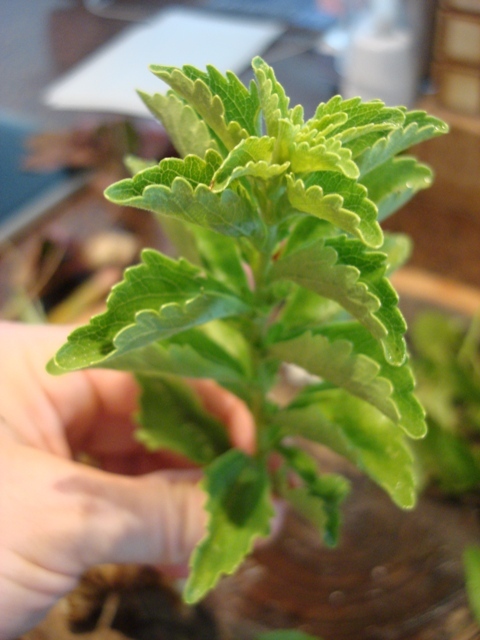 The part of the plant that I like to use for flavor is the base of the stalk, but the leaves can be used as well. I cut off the top and use the bottom few inches. The bulbous bottom has a tough outer husk. This part is easily cut off and can be composted. The white inside is tender and full of flavor. You can chop it up, slice it, bruise it, mash it… whatever. I usually bruise mine with the back of my spoon and then slice it up. 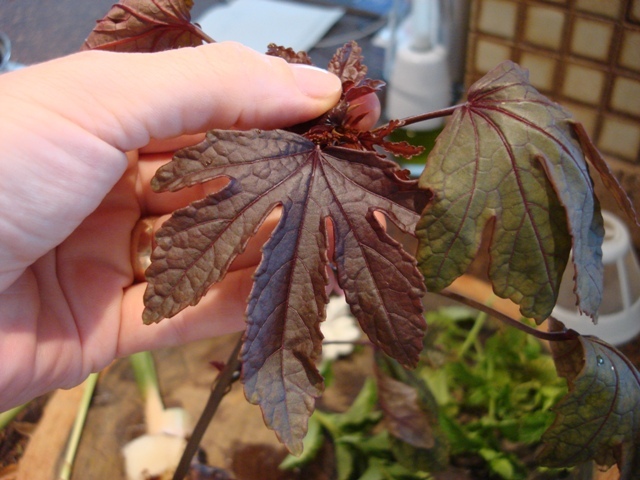 You could add the whole plant to a soup base and then remove it after its imparted its fabulous flavor. 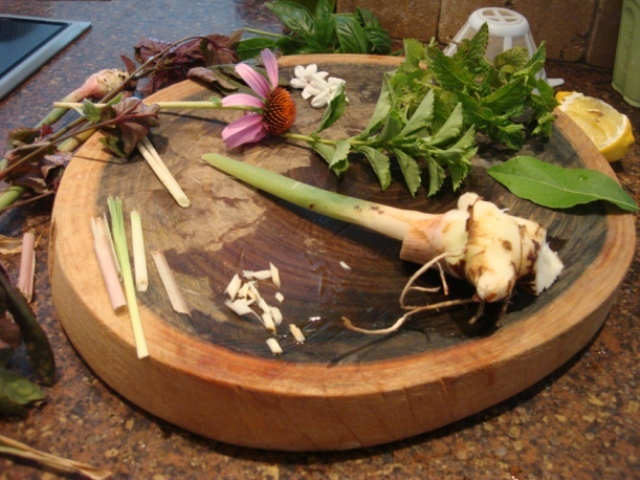 I frequently add lemongrass to lemonade, limeade, iced tea, stir-fries and rice. My absolute favorite lemongrass meal is lemongrass coconut chicken. My family loves it. I just put canned coconut milk into a pan. 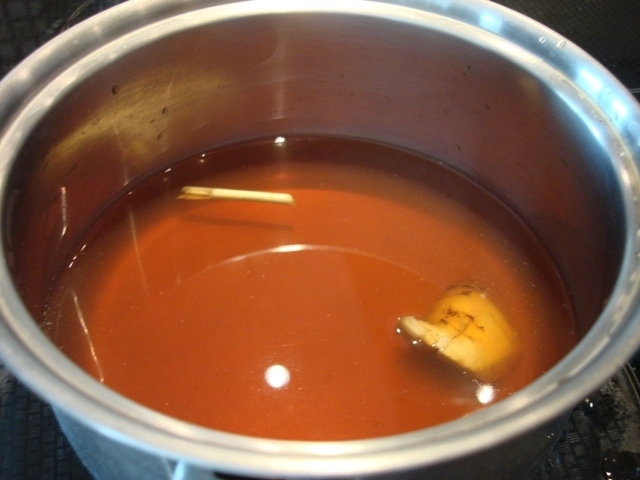 I add about 3 tablespoons of fish sauce (available at almost any grocery store and can be used to flavor so many foods), fresh galangal or ginger, sliced lemongrass stalks, a little sugar and a few kaffir lime leaves. I let it simmer for about 5 minutes and then I add the chicken. I cover it and cook it for about another 15 minutes until the chicken is finished. When it’s finished I squeeze a fresh lime on it (if I’ve got it) and throw a little fresh basil on it (if I’ve got it). I serve it with rice. Sooooo delicious! 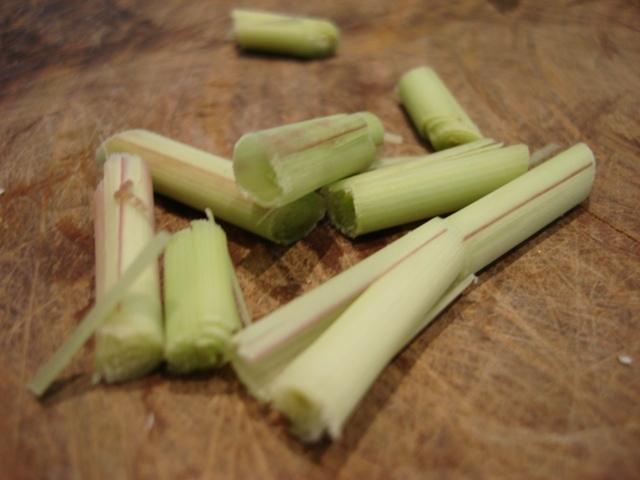 Lemongrass could be used in the kitchen everyday. 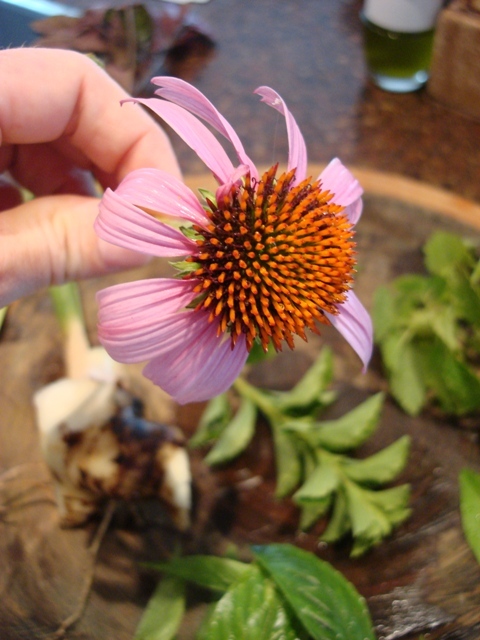 It has a fabulous flavor, numerous health benefits and there are so many ways to use it. I’ve definitely talked myself into planting more. This is edible landscaping at its best. Yogurt happens when bacteria consume natural milk sugars (lactose) and excrete lactic acid. Yogurt has two bacteria in it… Lactobacillus bulgaricus and Streptococcus thermophilus. They are tiny living organisms that are similar to the bacteria that we already have in our gut. It is said that these friendly bacteria are good for us because they help us keep our immune system healthy. There are many other beneficial bacteria too, but they have to be added to the yogurt separately. Lactobacillus acidophilus, Bifidobacterium and L. Casei are examples of the probiotics that can be added for extra health benefits. Many of the yogurt brands that can be bought in the supermarket have added good bacteria such as acidophilus, but they aren’t forthcoming with how much is actually in there. Delicious, healthy and homemade yogurt. Store bought yogurt usually has added ingredients in them like pectin and gelatin so they can make them thicker and cut their production costs. I stopped buying them a long time ago. I am lucky enough to have a mom that keeps me stocked-up with her homemade yogurt. She recently acquired some Indian yogurt starter (bacteria) that knocked my socks off. It’s the best yogurt I’ve ever had. So now, I’m making it myself to relieve her of the increased demand. It’s not hard at all. Anybody can make it… although some people have special secrets to make theirs incredible. 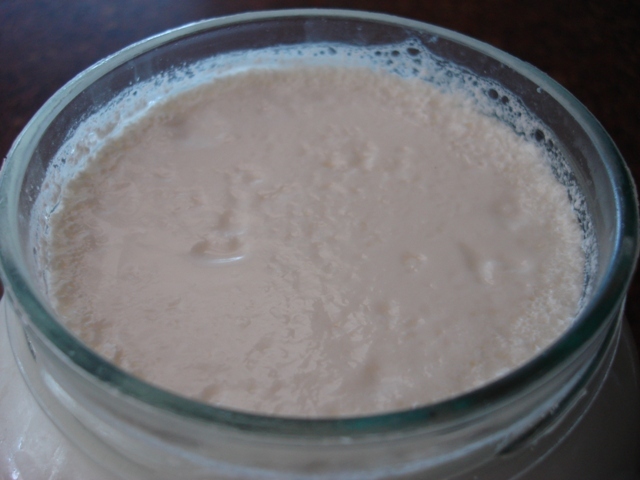 Homemade yogurt is made with milk and a starter culture. 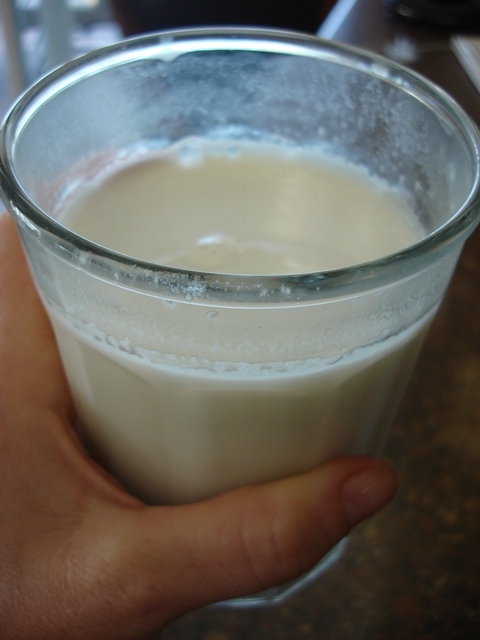 The milk can be whole milk (makes thicker yogurt) or skim milk (makes thinner yogurt). Your yogurt will only be as good as the starter you use though. You can use any yogurt as a starter culture, but the better it is… the better yours will be. Stonyfield Organic Plain yogurt is a good starter that can be bought at the grocery store. Yoplait would probably give you less than satisfactory results. A good quality milk is a must too. 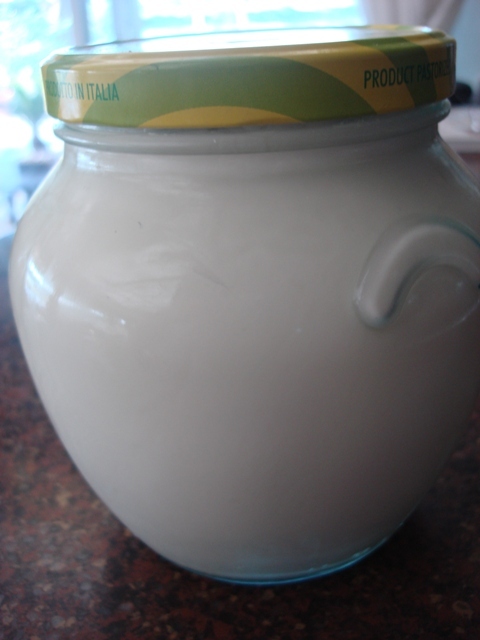 Homemade yogurt in an olive jar. My mom makes her Indian yogurt by heating two gallons of whole milk in a pot to 200 degrees on her stove-top and keeping it there for 20 minutes. You’ll want a layer of cream to form on the top. If you like thicker yogurt, then heat it longer, up to 30 minutes. For thinner yogurt, 10 minutes. My mom cools hers down to 120 degrees and “innoculates” it with her starter culture. She “innoculates” it by adding 1 cup of the 120 degree milk to about one cup of her starter culture and mixes them together really well. 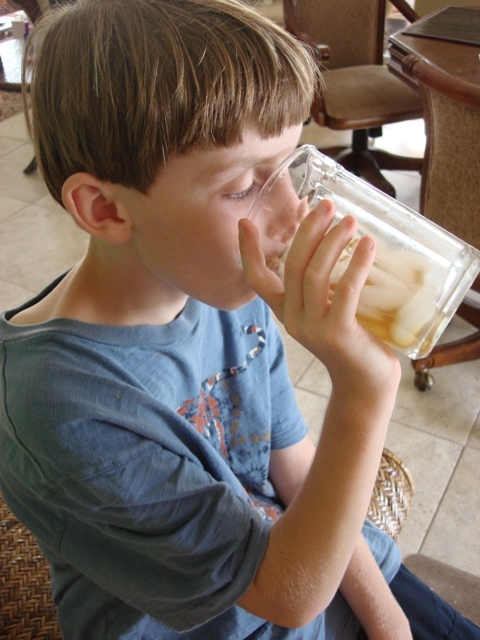 It’s important that the bacteria mixes with the warm milk. Then she mixes it with the rest of her 120 degree milk. (A hand-mixer works great for this, but she insists on mixing it by hand). She puts it in jars right away and huddles them close together inside her oven. She leaves the light on in her oven for warmth, even though the oven is off. The oven can be pre-warmed to 180 degrees to make it a desirable temperature for better results, but turn it off about 15 minutes before you put your yogurt in. She lets her yogurt “set” in her oven for 9 hours (overnight). It is left completely undisturbed. Yogurt gets more tart the longer it is left to set because acids develop. If you want a milder flavor that is less tart, the yogurt could set for 3-4 hours. After it is set, it should be refrigerated. My mom makes a lot of yogurt at one time, but it is easy to make less. The ratio is usually about 4 cups of milk to 1 tablespoon of yogurt. The measurements don’t have to be exact. 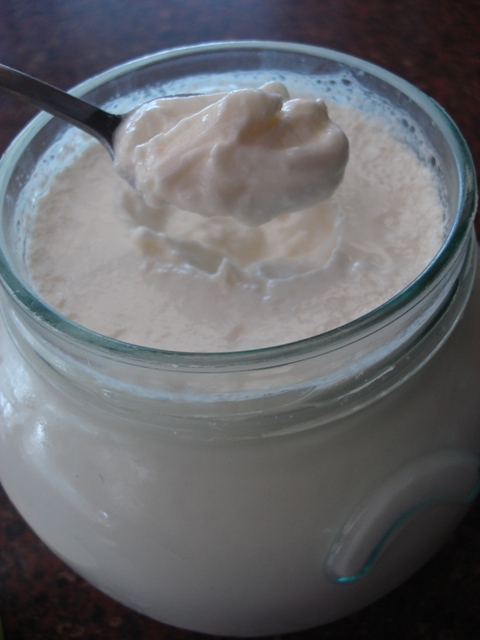 My friend Amy over at Dish on Design did an awesome blog on how to make your own yogurt. I also found a great YouTube video that shows how to make Indian yogurt in your microwave. Check it out by clicking here. My absolute favorite way to enjoy my homemade yogurt is in a bowl with honey on it. But since I have trouble moderating myself, I have a second favorite way with fewer calories. It’s an Indian recipe called “Sweet Lassi”. I blend (with a hand-mixer) about 1.5 cups of water with a half cup of yogurt. 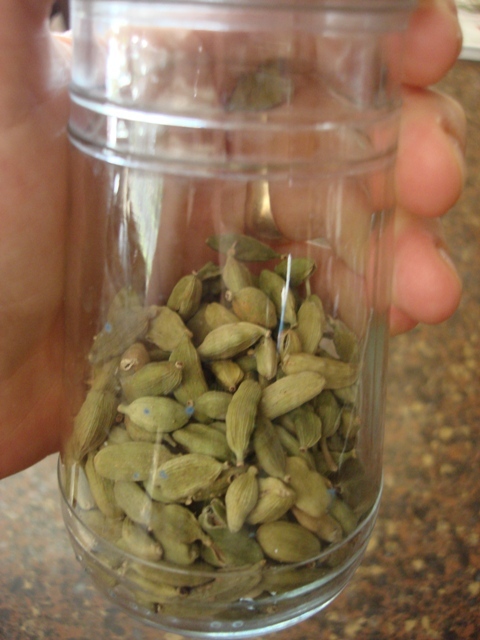 I crush a green cardamom pod with the back of a spoon and throw the seeds into the yogurt along with some sugar. 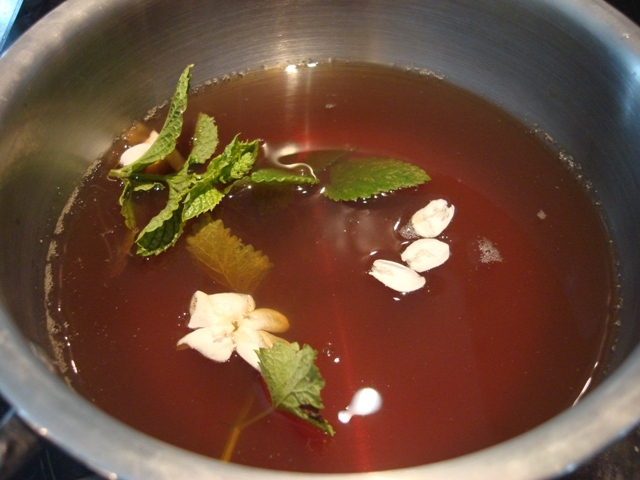 I add about half a teaspoon of rose-water and I garnish with mint. I just absolutely love this! 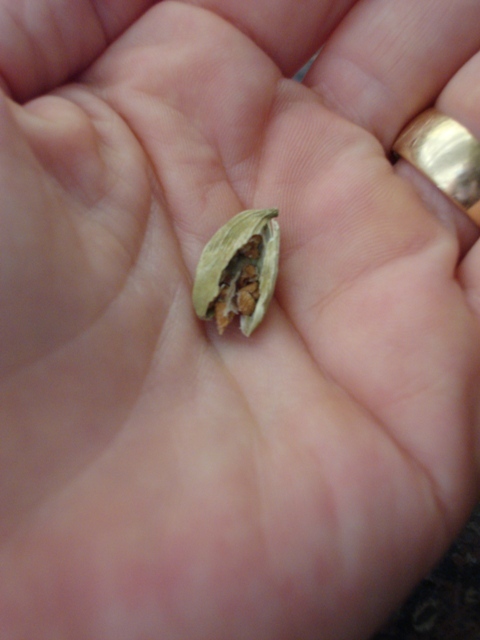 A crushed cardamom pod with the seeds inside. A sweet, sweet lassi. It was garnished with mint. My daughter ate it before I could take the picture. Homemade yogurt is so delicious and so easy, you’ll never buy it again. You won’t have to because you always save a little bit of your yogurt to use as the starter for your next batch. It is a bit of trial and error in the beginning, but once you figure out what works for you, it will work every time. I think angels eat lychees in heaven. If you haven’t ever tried a fresh lychee, don’t turn it down at your next opportunity. It’s lychee (Litchi chinensis) season in Southwest Florida and we are stuffing ourselves with them while we can. When lychees are ripe, you have about 2 weeks to pick them off the tree. The good news is that they freeze really well. If you don’t peel them or break the skin and you put them in a freezer bag, they will taste just as good in 3 months as they do now. A bunch of fresh lychee fruit. 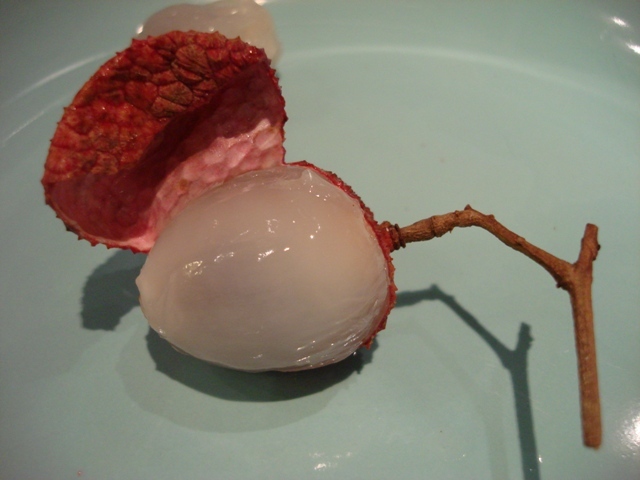 The peeling easily comes off a lychee fruit. 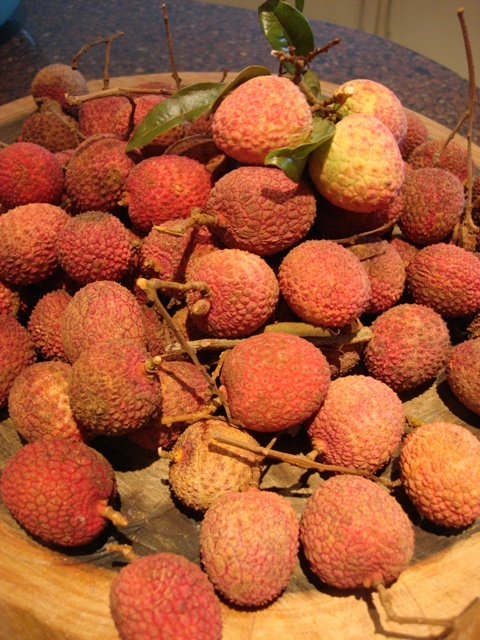 There are many different varieties of lychee. The best tasting is a variety called “No Mai Tze”, but it only fruits every 4-5 years. Most other varieties will give you fruit year after year if the tree is mature. The younger trees are not as reliable. 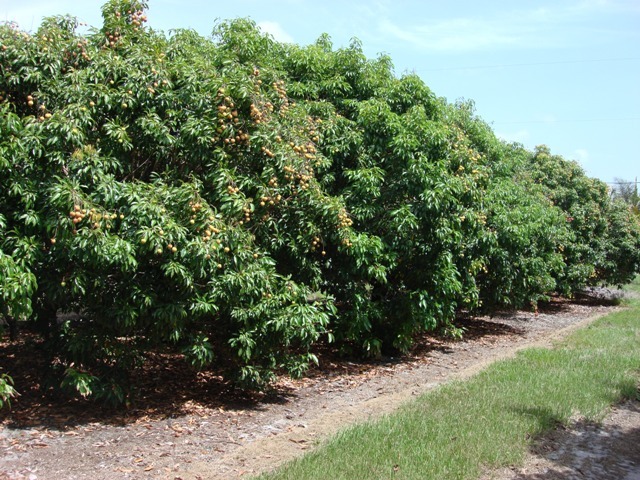 There are several mature lychee trees growing in Immokalee, Florida that are about 60 years old and are loaded with fruit year after year. The best way to tell if the fruit is ripe is to taste it. If it’s really sweet, it’s ripe. That may sound silly, but color isn’t always indicative of ripeness. There’s a variety that stays green when ripe. Grayson had never tasted a fresh lychee before and could hardly wait to try one. Our little lychee tree in our yard is too young to give us fruit so I took him to the home of the best lychees in America… Pine Island, Florida. 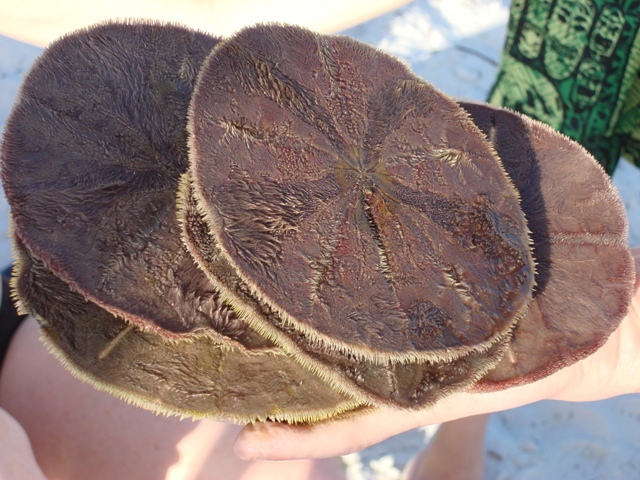 Bokeelia on Pine Island, Florida. The Treehouse Nursery on Pine Island has over 20 different varieties of lychees (and 80 different types of mangos). 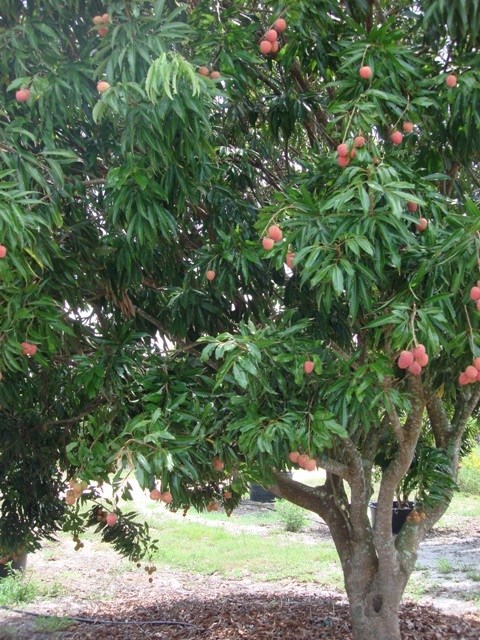 The nursery has a small team of experts that have extensive and unsurpassed knowledge about growing lychee and mango. If you’re ever in the area, be sure to check out their exotic fruit stand. It’s open on the weekends during the summer season. 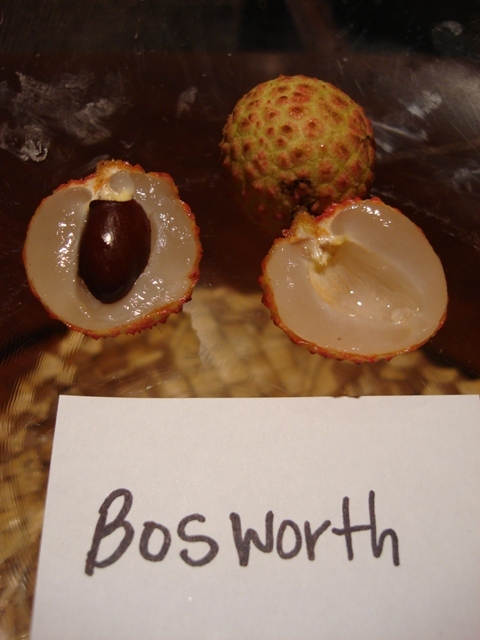 We tasted 5 different types of their lychees. 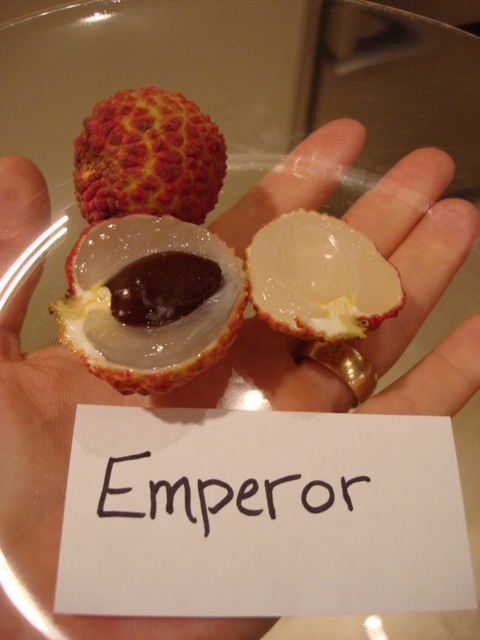 The Emperor lychee is huge and the tree has a high productivity. 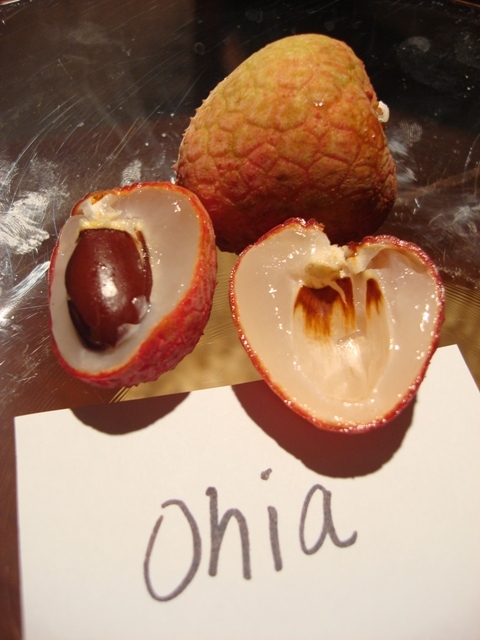 The Ohia lychee is a medium size fruit. The productivity is high on this one too. 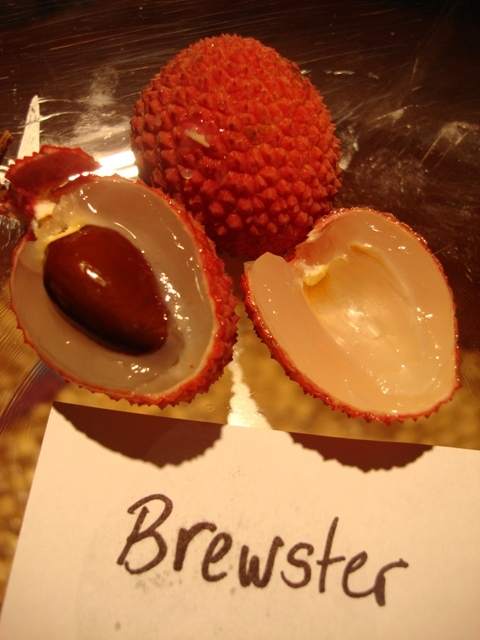 The Brewster lychee is a medium size fruit with a large seed. The Bosworth lychee, also called Kwai Mia "Pink". 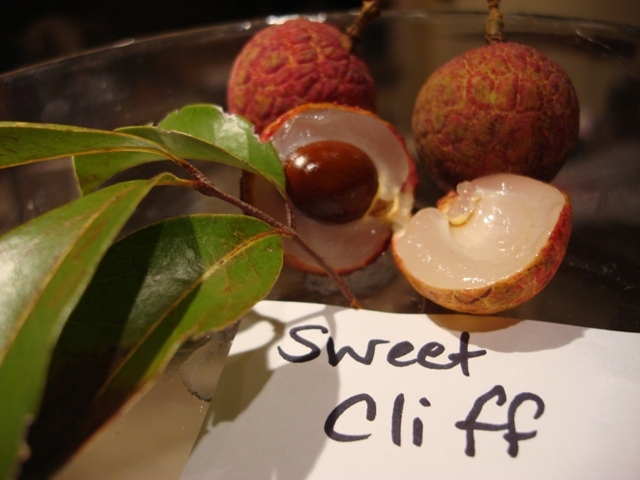 The Sweet Cliff is a cross between the lychee and the longan. It is a smaller fruit with a very high productivity. A lychee tree that is planted from seed will take about 10-20 years to give you fruit. Most of the trees at The Treehouse Nursery are air-layered by expert grafters. This is the best way to start a backyard lychee tree. A lychee tree with fruit... the Sweetheart variety. A lychee tree can provide a huge harvest of fruit in a season. Lychee trees need quite a bit of water for the fruit to ripen. When you see flowers, make sure it gets plenty of irrigation until after the fruit is all picked. The tree doesn’t need as much water after that, but still needs it. It isn’t drought tolerant. They also need fertilizer on a monthly basis when growing the tree to the desired height. Once the height is achieved, the tree should be fertilized monthly from the day you see flowers on it until the last fruit is picked. After that, you can stop feeding it until you see flowers again. A lychee tree is best kept pruned at the desired height, which is usually about twelve feet. The more you prune it, the less brittle the branches become. It is also important to add about 6-7 inches of mulch around the base of the tree. This insulates the surface roots. Don’t put the mulch right up against the trunk though because it could harm the tree. 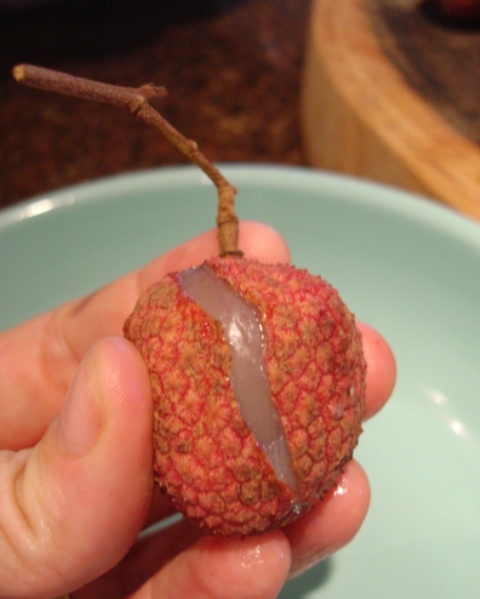 Great news about growing lychee in Florida… they’re not affected by nematodes. The nematodes in Florida are a huge problem for growers. Lots of lychee trees. I wish this were my yard. We're working on it. 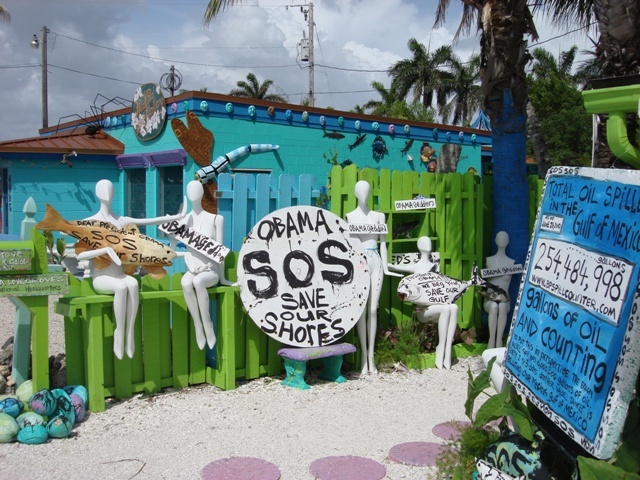 If you do happen to make it to Pine Island, make sure you visit “Great Licks Ice Cream Shop”. They’re right on Pine Island Road (in Matlacha) and they have the best homemade ice cream ever! They’re open seven days a week until 8 p.m. 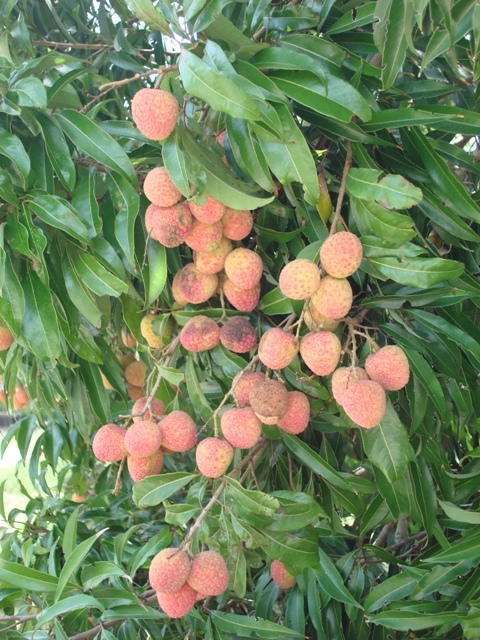 The fresh lychee shouldn’t be hard to find, they seem to be everywhere on Pine Island this time of year. I don’t feel like picking anything out of our yard today. I’m edgy and feel compelled to write a post about our current events. 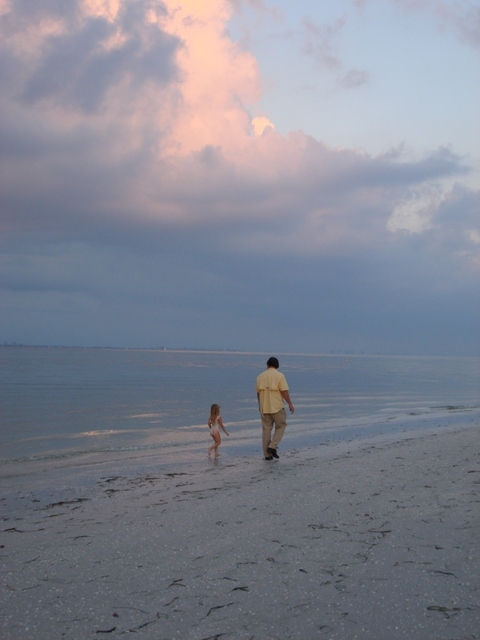 I took this picture on Sanibel Island in early May. I never imagined the oil would still be flowing in early July. 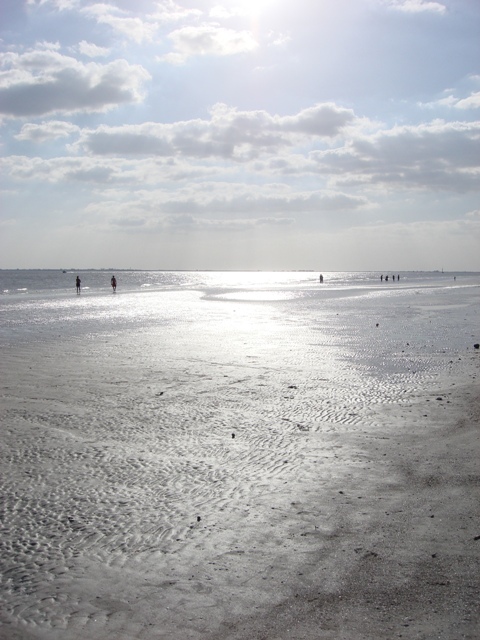 Our beloved Gulf of Mexico. 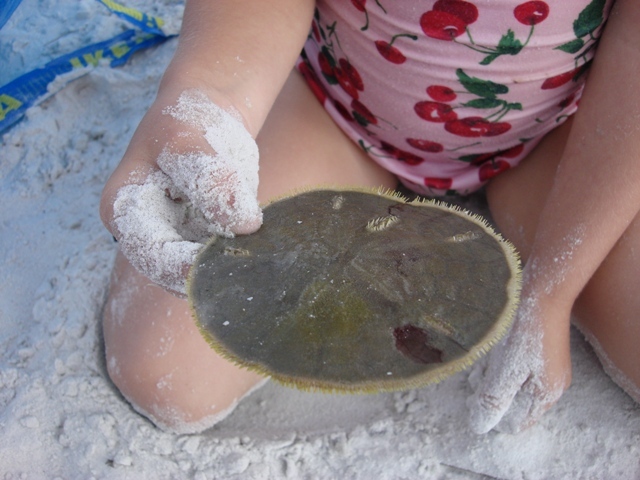 A sand dollar on Ft. Myers Beach. Nooo... we don't keep them. They're alive with a furry exoskeleton. They stain your fingers yellow. 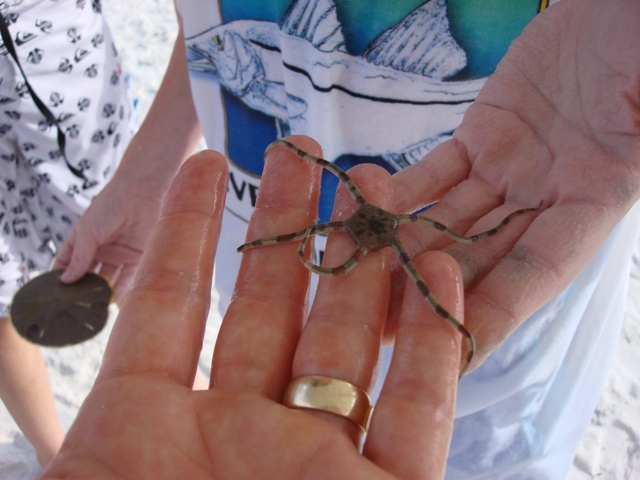 A star fish. They tickle. 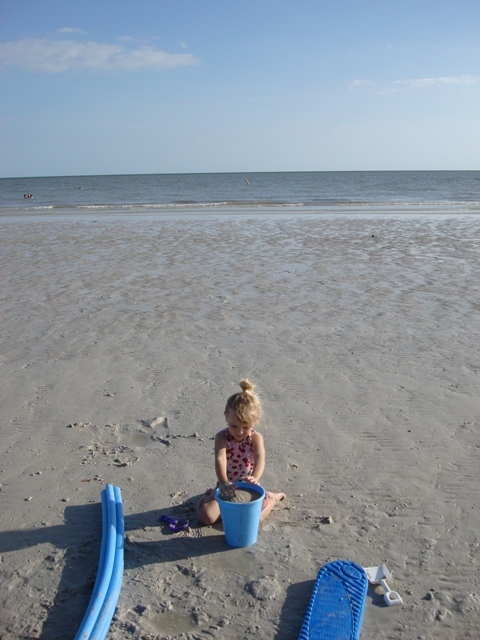 The Gulf of Mexico and life as we know it is going to change, obviously. It feels like there’s a storm coming, but it’s not a hurricane. It feels like a monster is coming. I’m nervous but I’m trying to keep the facts straight. Normally, when a hurricane is coming we run around like chickens with our heads cut off. We prepare everything and batten down the hatches. This storm is different and the only preparation I can do is gather every tid-bit of information I can find and sort through the truth and fiction… and wait. 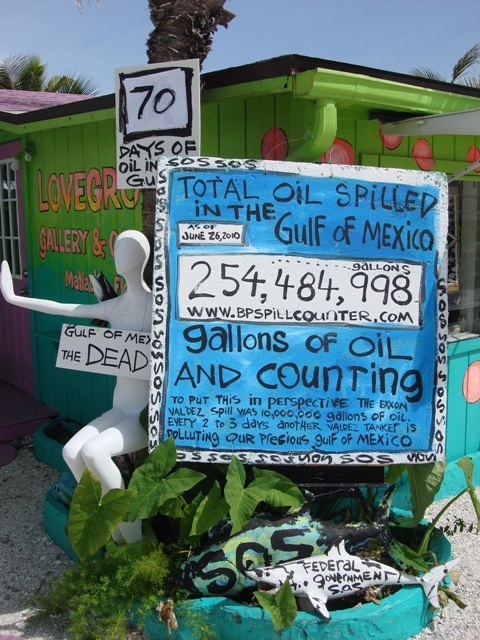 The truth: Corexit 9500(A) and 9527(A) are oil spill dispersants that were applied to the Gulf of Mexico until supplies ran out. They include VOC’s (volatile organic compounds) that have long-term health consequences that are very serious, including cancer. Benzene is included along with hundreds of other chemicals. For the Material Safety Date Sheet of Corexit 9500, click here. For the MSDS on 9527, click here. 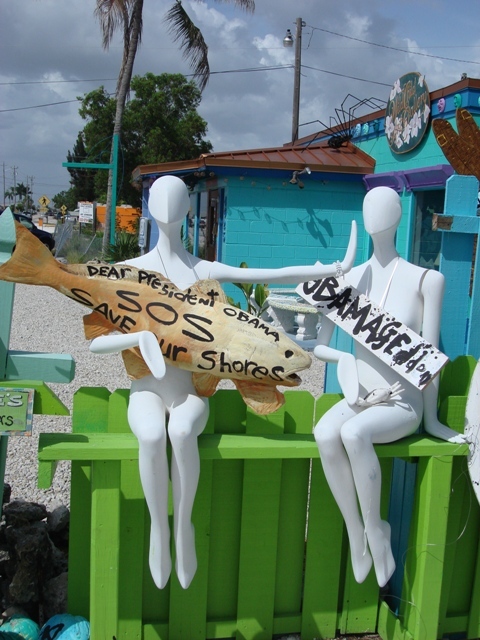 I’ve spent hours reading websites pertaining to the BP oil spill. YouTube sucked me in… I required help to get away. The government website made me think that it isn’t so bad after all. People must be fear mongering. Then I snapped out of it. OMG, I almost believed them. In my opinion, one of the best links I’ve found for information based on fact is a paper written by an M.D. He’s a Professor of Internal Medicine and Director for the Environmental Cancer Program at Wayne State University. He was also the Medical Coordinator of the Kibumbe Refugee Camp during the 1994 Civil War in Rwanda. Click http://www.Sciencecorps.org/crudeoilhazards.htm for his website. If you haven’t already gone crazy looking for information on this spill, you probably will soon. I found a great blog called the ‘Ladies Guide to the Apocalypse‘ that has tons of links. Her blog is a great read but… is not for kids due to the language. How far-reaching will the effects be? Are we breathing benzene right now and don't know it? Will the government be truthful with us and tell us if we need to evacuate? Is the low probability that a methane bubble could burst and send a massive tsunami over Florida becoming a higher probability with each passing day? What a mess mankind has made of our environment. Pure, undeniable greed. I hope it’s possible to learn something from it this time. I hope it’s not too late. The poison that has been let loose in our back yard is mind-blowing. Ask the right questions and demand the truth. Who’s looking out for our best interest? This is our life, our children’s lives and the life of our planet.